While President’s Day is typically associated with Washington and Lincoln, the holiday lends itself well to lessons and projects on all of our country’s Founding Fathers. Pair these presidential activities with Help Teaching’s graphic organizers and printable worksheets for the full presidential treatment. All you need is a Popsicle stick and a printed head shot of a president. Ask your students to write a script around an important concept or theme in American History, such as the writing of the Constitution, the debate over slavery, or even a silly dinner party at the White House. The students can use Help Teaching’s Plot Diagram to assist them in writing their script, or use the Story Map to develop the action in their tale. Baseball cards show a player’s statistics over his playing career. A presidential baseball card shows the chief executive’s accomplishments by year, his biographical information, and political affiliation. Help Teaching’s Writing Box with Lines is the perfect vehicle for this project. Paste the president’s photo in the empty box and put his presidential information in the lines below. Every president was once a candidate, and campaigning has been an American institution for over a century. Have your students research the issues of the day and create a campaign poster for their assigned candidate. Draw them in with a lesson on slogans, mottos, and campaign ads, showing them examples of modern day tactics from the campaign trail. Use Help Teaching’s Boxes and Bullets Diagram organizer to narrow down the most important issues of the candidate’s time. Make each of your students an “expert” on one president. Put together a living museum with five students speaking as the commander in chief per day. Use a simple Web Diagram worksheet to dictate which aspects of the president’s term should be emphasized. Give students a list of 24 presidents and instruct them to fill one in each box of a Bingo card (Don’t forget to leave the middle space free!). Then read a brief description of one of the 24 presidents. Students will check off the president they think you are describing. The first student with five checked off presidents in a row on the Bingo card wins! Help Teaching has a slew of worksheets to quiz students on the presidents of the United States. There are quizzes on presidents throughout history, just the early presidents, and activities surrounding both the 2008 and 2012 presidential election results. There are various YouTube channels dedicated to specific US presidents or the office of the president in general. Take a tour through “The American Presidents“, “Presidential Facts“, and the dozens of presidential libraries that offer YouTube channels. There are also plenty of Hollywood films that will enhance any lesson or activity about residents of the White House. Films like 1776 show our Founding Fathers as they fought for independence from Great Britain; Lincoln, the recent awarding winning film starring Daniel Day-Lewis, is a gripping account of one of our greatest presidents; HBO’s miniseries on the under appreciated President John Adams has many interesting nuggets to share; Thirteen Days in a terrific film that captures the tension in the country during the Cuban Missile Crisis, under the stewardship of President Kennedy in 1963. For more tips on using film in your class, see an earlier post on “How to Use Hollywood Movies in the Social Studies Classroom“. President’s Day is more than just a day off from school, and it is more than a day to remember Washington and Lincoln. 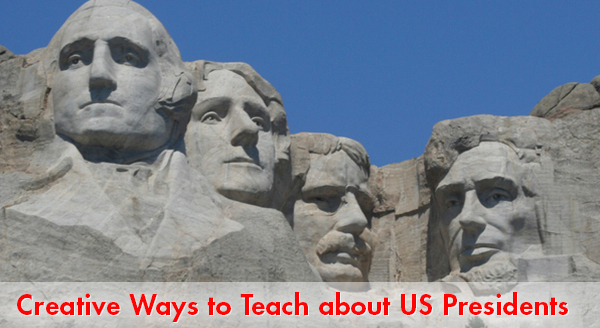 Use the activities above to make learning the presidents fun and exciting and don’t forget to check out Everything Your Students Always Wanted to Know About Electing the President, but were too Afraid to Ask. This activity highlights the many roles any president assumes. It is called 7 Hat Challenge and would be a minimum of 4th grade. I found it at http://monthbymonth.scholastic.com/teach.html Go to the teach_presidentsdayteach.pdf Free item.